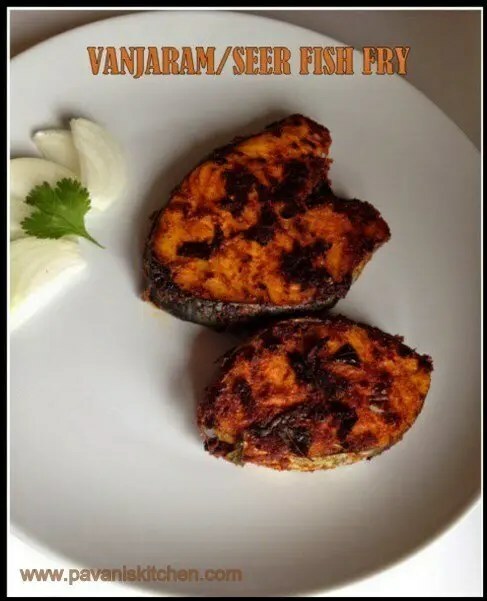 Today recipe is about fish fry that is Vanjaram /seer fish fry. When we are in India, Athamma used to prepare it a lot. We are having this fish fry after 5 years and it tasted very well. Here goes the recipe. 1. Clean the fish and pat dry. 2. Take a bowl, add chilli, coriander, turmeric, cumin powder, tomato ketchup, ginger- garlic paste, salt and chopped leaves. Mix well. 3. Add lemon juice and make a thick paste. Do not add water. 4. Add 1 tbsp of oil and mix well. 5. Apply this mixture nicely to the fish and leave it to marinate for at least 1-2 hours. 6. Take a pan add 1 tbsp of oil and slowly put the fish in the pan and fry on both sides on medium flame until both sides are a golden colour. Do the same procedure for the remaining pieces. 6. 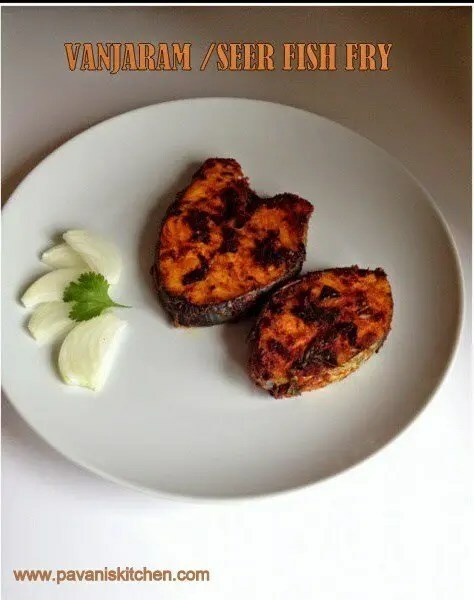 Transfer them to a serving plate and enjoy this tasty and delicious Vanjaram /seer fish fry. 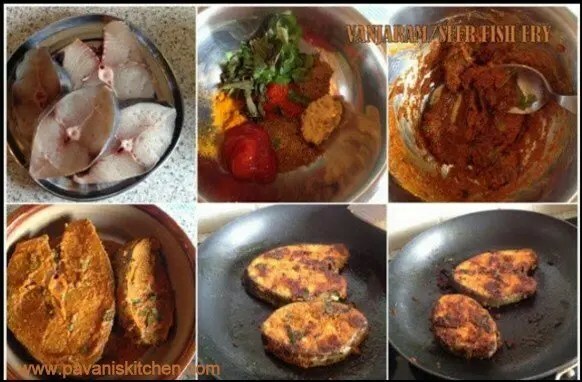 Learn how to make this tasty and simple Vanjaram/Seer Fish Fry. Take a bowl, add chili, coriander, turmeric, cumin powder, tomato ketchup, ginger- garlic paste , salt and chopped leaves. Mix well. Add lemon juice and make a thick paste. Do not add water. Add 1 tbsp of oil and mix well. Apply this mixture nicely to the fish and leave it to marinate for at least 1-2 hours. Take a pan add 1 tbsp of oil and slowly put the fish on the pan and fry on both sides on medium flame until both sides are a golden color. Do the same procedure for the remaining pieces. Fantastic fish fry, hard to resist..